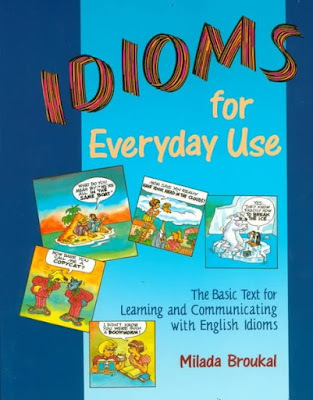 Idioms for Everyday Used has been the teacher's favorite to teach idioms in the context of amusing stories, giving learners their first exposure to idioms by introducing more than 230 common idioms; organized into 20 units, each with a general theme such as colors, food, geography, and time. A unit covers idioms with words related to its theme; for example, the idioms in the color unit include in the red, to feel blue, red tape, and white lie. Meanings--offers examples of the idioms in context ands asks the learners to actively determine their meanings. Practice--provides ample opportunity to master the idioms. Students may be asked to judge whether an idiom fits a context or whether the form of an idiom is incorrect. Conversation--present idioms in natural conversations for role-plays and encourages learners to create conversations of their own. Discussion--invites learners to make cultural comparisons and provides real-life stories or examples that illustrate usage--illustrated with cartoons that provide entertaining and instructive visual interest.